The main bet is broken into the “Ante” and “Play” stages, which gives the main bet its name. In some casinos, the ante bet is mandatory. In many casinos, the player has the choice to make an ante bet or not. (In either case, “Pair Plus” wagers are mandatory.) Once the Ante and Pair Plus bets are made, then the dealer deals three cards to the player and three cards to the house. Players take a look at their hands. Those players who made an ante bet then must make a decision: fold or place a “play” bet. The “Play” bet is equal to the original ante wager, so the player must decide (after looking at their cards) to double their original bet or fold. If they fold, they lose their original ante bet. After the play wager is made, then the dealer takes a look at his/her hand and all bets are resolved. A hand takes place fairly quickly, which the casino enjoys, because the game has a house edge about twice that of European roulette, craps, and baccarat. Three-Card Poker has a better house edge than American roulette, keno, and most slot machines, though. Four various pay tables exist on the ante wager and the house edge on these varies between 3.37% and 4.28%. The Pairplus Bet can be seen as the side bet, though (as mentioned earlier), you can find games in which you have no need to make the ante wager. The house edge tends to be higher on Pair Plus, so gamblers should play both. If the mini-royal jackpot rule is in effect, you’ll find seven different pay tables, which have a house edge of 2.32%, 2.7%, 3.49%, 4.58%, 5.1%, 5.57%, and 7.28%. If no mini-royal rule is in effect, you’ll see one of 6 pay schedules, which can be 2.14%, 4.2%, 4.38%, 5.39%, 7.1%, and 7.73%. A “mini royal” jackpot includes an additional way to win: a suited ace, king, and queen. This wager is called “pair plus” for the same reason video poker games are called “Jacks or Better” or “Tens or Better”. A pair of anything is the basic winning bet. To win the Pairplus Bet, you’ll need at least a pair of 2’s. Note that a pair of twos is as good as a pair of aces, but this is still a high bar in a game with only three cards. Other winning hands include a flush, a straight, three of a kind, a straight flush, and (in some cases) the mini-royal. Keep in mind that flushes and straights are more common, since you only need three cards to match up, instead of the usual five. A handful of casinos offer an additional rule in which the mini royal pays out more for spades than for other suits. 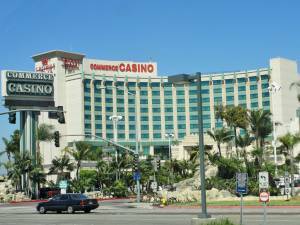 Some casinos offer a “prime” payout, which pays off 4:1 if all three player cards and all three dealer cards are suited. So if you hold three hearts and the dealer holds three hearts, you win a 4 to 1 payout when the prime rules are in effect. Caesars Entertainment casinos are known to offer an additional side bet called the “6 Card Bonus”. This pays out based on the best 5-card hand made from any combination of your 3 cards and the dealer’s 3 cards. This side bet pays if these cards combine for a three of a kind, straight, flush, full house, four of a kind, straight flush, and royal flush. So you can gauge your interest, the payout on the royal flush is 1000:1. Keep in mind you get six cards to make this hand, so your odds of hitting a royal flush are greater than in 5-card stud games and less likely in Texas hold’em and seven-card stud. Three card poker is a fast-paced game which most novice gamblers should be able to enjoy without a whole lot of study. Knowing the card ranks and hand ranks is enough for most players. Keep in mind that the house edge is high and the game moves quickly, so regulate your bets well. Remember that any bet on the ante and play wager must be doubled if you expect to win, so keep that in mind when making your ante wager.